What makes EVRYTHNG unique that we focus on connecting ALL products to the Web, not just electronic goods. We may think IoT is synonymous with connected appliances like fridges today, but it’s worth remembering that the origin of term ‘Internet of Things’ was conceived in MIT’s Auto-ID labs in 1999 and it was based on connecting a network of dumb, non-electronic products via RFID tags. So EVRYTHNG doesn’t discriminate about the kind of product can be made smart. Consumable products are on-boarded to our IoT smart products platform by scanning a product tag or packaging code. We believe that manufacturers of consumer packaged goods are just as eager to get to know their customers better and to extend those relationships through IoT strategies. And we passionately believe that, when consumable and durable products are connected to the Web, they offer an entirely new category of use cases. For example, my refrigerator can tell me whether I have the required ingredients for a recipe I’m planning to prepare and if any of the items have exceeded their ‘use by’ date. Or, my frozen dinner can instruct my microwave oven how it is to be cooked. At this stage, we can only begin to imagine the possibilities of an IoT world that includes virtually every physical thing in existence. The IoT technology we’ve developed for tagged goods applies equally to fully connected products. After all, both active and passive products share the requirement for many common elements such as management of huge volumes of data, integration with a variety of ecosystems, enterprise security, protection of customer privacy, service level guarantees, and the ability to scale to millions of discrete products. 1) Before embarking on any IoT project, consider the value proposition: namely, who benefits and how. 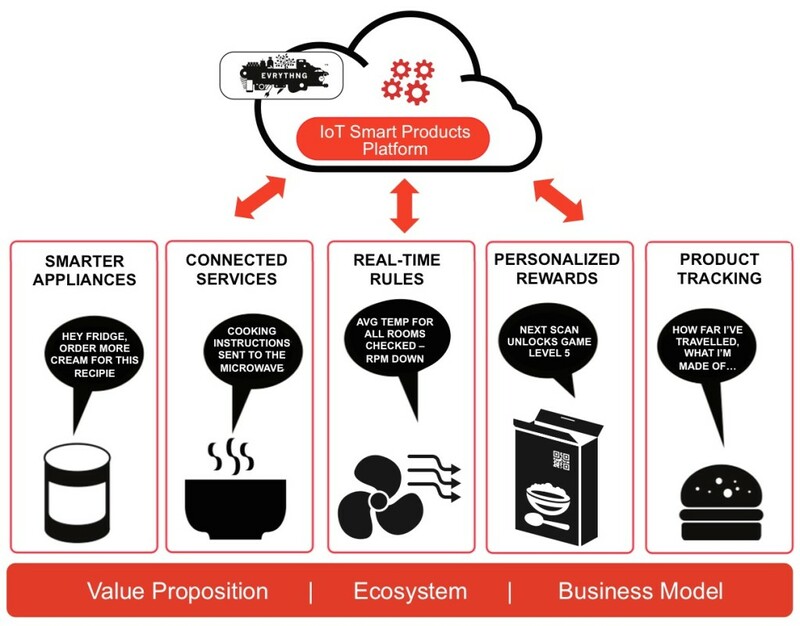 The way I get at this with customers is by asking the simple question: Why are you developing an IoT product? For most companies, it’s the end consumer who is supposed to benefit from the connectivity, however, I still see companies struggling to come up with convincing customer-facing use cases they believe in. 2) Next, do not overlook the complexities of the ecosystem. Connectivity is NOT “just another feature”. Consider both how your connected product will affect your ecosystem partners and how they in turn will influence your success or failure. As a simple example, studies suggest that if a customer fails to get the product connected after about 5-10 minutes, they will give up and return the product. That’s a direct expense to your retail partner that cannot be overlooked. 3) Finally, you have to develop an acceptable ROI goal and business model that enables you to achieve it. This is an area where the industry is still struggling. One clear learning is that consumers are highly intolerant of new subscriptions but are reasonably open to adding service to an existing subscription. This bodes well for service providers and b2b plays where a service contract is already in place. Most product manufacturers are taking the approach of simply marking up the the ‘connected’ version of the product to maintain margins, which is straight-forward but puts even more emphasis on a compelling end user value proposition. Here I’ll close with what might be a controversial prediction: just as your cellular provider discounts the price of your phone to far below market level, the value of a connected customer will be so great that product manufacturers and their ecosystem partners, will eventually happily subsidize any additional cost for connectivity just to reap the downstream benefits once those products make their way into the hands of consumers.